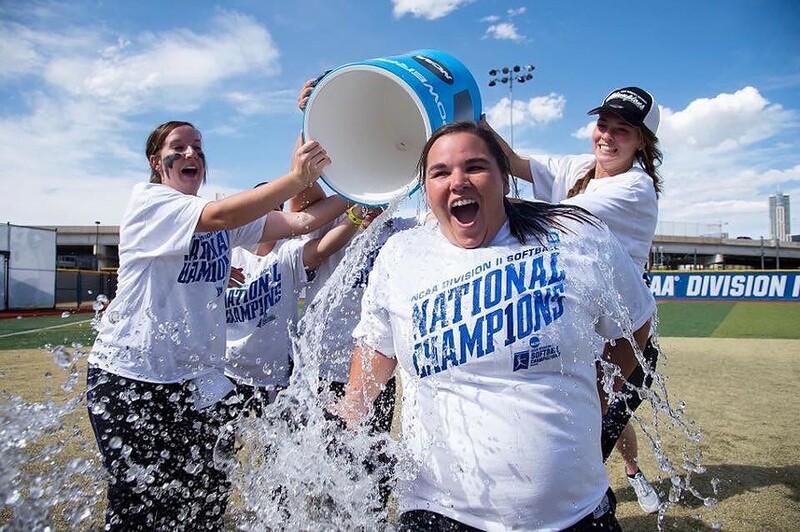 The Lions celebrate their national championship with the ice bath of victory. The Lumberjacks entered Saturday needing just one win to become national champions. It wasn’t meant to be. The Humboldt State University softball team dropped both its games Saturday to lose the best of three NCAA Division II national championship series in Denver to the University of North Alabama. HSU got off to a good start in the series Friday against North Alabama, which boasts the nation’s third best offense, thanks to a 5-0 shutout from ace pitcher Madison Williams. That sent the Jacks into Saturday’s double-header needing to beat North Alabama just once to capture the third softball national championship in HSU’s history. But North Alabama’s heralded bats found their groove, walloping the Jacks 10-1 in the early game and outlasting them 4-1 in the final. The North Alabama Lions’ Hillary Carpenter pitched complete games in both Saturday’s matchups, pushing the junior’s collegiate world series record to a perfect 5-0 and earning her the nod for the tournament’s most outstanding player. For more on the Jacks’ impressive season (the team went 54-8-1), check out the HSU athletics page here. And, for complete coverage of Saturday’s games, check out Danny Penza’s story in the Times-Standard here.